I wonder what impact George Aperghis’ Récitations may have on a non-French speaking listener. It is sooooo French, steeped in the love of the language and the glee at playing with it and turning it inside out, so characteristic of a long tradition of French writers counting Rabelais and Victor Hugo among its most distinguished representatives and leading down to the literary movement Oulipo (OUvroir de LIttérature POtentielle, Opener of Potential Littlerature) and Georges Perec, and of French culture in general: the love of “contrepèterie” (spoonerisms), or the inversion of syllables in apparently normal phrases to unearth a bawdy meaning (« Those girls have a cunning array of stunts. »), is as much a French tradition and specialty as cheese, wine and trumpeting to be the beacons of civilization and Human rights while doing exactly the opposite .So I wonder if someone who doesn’t share that love at playing with (French) words can really and fully appreciate Recitations. Although Aperghis was born in Greece in 1945, he established in France when he was 18, and was in 1973, with “Pandemonium”, one of the inventors of the French “theatre musical”. Maybe because he adopted the language rather than grew with it, he became more French than the French. But after all, the hilarious humor of Walton’s and Edith Sitwell’s nonsensical Façade isn’t so far away. This translation is only ONE possible interpretation of bits of phrases which can often be construed differently. Anyway, the Sprechgesang starts in fact not at the beginning (leading you to think first that you were not given the complete text) but right in the middle : “that way” ; then back a word or two and past the middle a few words : “you mustn’t call yourself that way go ask him yourself”, then back one more step and move forward another step: “it is one you mustn’t call yourself that way go ask him yourself –and then” and so forth in this seesawing until the complete text is delivered: it takes five minutes. Some other Récitations (like 8 or 10) are written on three columns, and can be alternatively delivered vertically, column after column, or horizontally. And this is, of course, only the skeleton. It lies on the performer, much more than in traditionally notated Song and Lied with their regular time-beat, to characterize and flesh out those words, and to create, as they would do in the theatre, a character. Récitations were written for the French actress/singer Martine Viard, and I reviewed her seminal recording of eleven Récitations, made under the guidance and supervision of the composer for Harmonia Mundi in 1982 and reissued to CD by Disques Montaigne in 1992, so I was curious to hear an alternative interpretation. Pauline Vaillancourt is a singer from Québec and her take is quite different from Viard’s, more of a singer, more lyrical, not as virtuosic, high-strung and breathless but more elegant and refined. I’m happy to have both, although none, it must be said, is definitive, if only because none is complete: Viard omits 2, 4 and 6 (but repeats 10 – more precisely, its left column – in widely different interpretations, and performs the three columns of 8 – but not its horizontal version); Vaillancourt does two columns of 10 and three of 8 (but not the horizontal versions), but omits 1, 2, 4 to 6 and 13. 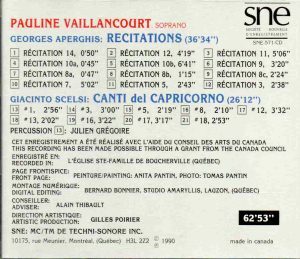 But with that, Vaillancourt offers you almost as much Aperghis time as Viard (36’30 against 38), to which she adds the substantial bonus of 26 minutes of Scelsi’s Canti del Capricorno. Donatienne Michel-Dansac, a regular performer of Aperghis’ compositions since the 1990s, has recorded what I think is the complete set on Col Legno, but I haven’t heard it yet. I suspect that this is the version to get if you have only one. Scelsi’s Canti del Capricorno were written in 1972 for the Japanese soprano Michiko Hirayama. I bought her Wergo recording years ago, and loathed it: it sounded to me like guttural shouts, painful to hear. I haven’t felt so ruffled by Vaillancourt’s interpretation: is it because my ears have grown or because Vaillancourt is more lyrical and palatable? The Wergo disc is long gone from my collection, so I can’t check – but it’s both, probably. Vaillancourt does give the impression that she is singing; my memory of Hirayama is that she screamed. Written in an invented language made of “glottal stops, nasal sounds, microtonic intervals, driving sylbles or rolled rrr’s” (to quote the liner notes), Canti del Capricorno sounds like a reinvented Japanese or Tibetan ritual. An appropriate discmate for Aperghis’ Recitations, with which it shares a common exploration of contemporary vocal techniques. Fairly outlandish, but nothing really shocking for someone with a good experience of avant-garde contemporary music. Again Vaillancourt sings only nine selections from the 19 that comprise the composition.